Is FCA Crazy Enough To Give 2018 Jeep Wrangler 6 Engine Options? Diesels, V6s, inline-fours, maybe turbos, you name it. Aside from the Ram pickup truck—the third best-selling vehicle in America—FCA’s truck and SUV division relies heavily on the iconic Jeep Wrangler to bolster its sales, and with 191,774 of them sold in the US this past 2016, the much awaited 2018 Wrangler is a huge deal for the automaker. We’ve heard a good deal about its replacement already and, if images leaked to Jeep Wrangler Forums (shown here) are accurate, then the next generation of the famous off-roader has already made an appearance of sorts. Now, a tip sent to Jalopnik seems to fill in the rest of the blanks. We won’t see these in any rendering images though because the tipster, purportedly a source with connections to an FCA assembly plant, claims to have gotten hold of information on the 2018 Wrangler’s engine options, of which there will be six. It’s best to have a salt shaker nearby to heed this tip with a few grains of it. That's because the current Wrangler is only offered with a 3.6-liter V6 across the board, making a leap to 6 power plants a bit of a reach. 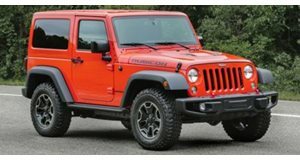 Nevertheless, the 2018 Wrangler will supposedly have two versions of that same 3.6-liter V6 Pentastar engine as well as two versions of a 2.0-liter four-cylinder engine, likely to give the eco-conscious a pair of fuel-saving choices. For towing purposes, more important now that a Wrangler pickup truck is on the way, torque-packed diesel engines will make it to the options list, one in 2.2-liter four-cylinder format and another as a 3.0-liter V6. We’ve been hearing rumors about a diesel Wrangler and it would seem an obvious choice for Jeep, however US regulators may rain on that parade with a lawsuit against FCA that claims its diesel power plants cheat on emissions testing, although not as blatantly as Volkswagen’s did. Aside from what we already know about the 2018 Jeep Wrangler, no other information has leaked, including any indication that a manual option will be preserved.